A few months ago the restoration of the fountain-monument to Benvenuto Cellini was finally completed and water started flowing again. It has been years, so many that people even forgot it was a fountain at all, since the water had been shut off because of damage to the pipes. The municipality of Florence financed the repair by renting the Ponte Vecchio to Ferrari for a very exclusive (and highly criticized) dinner and we can now enjoy it the way the fountain had been originally conceived. The fountain – monument was conceived to commemorate the 400th anniversary of Benvenuto Cellini’s birth (November 3rd, 1500) and the work was solemnly inaugurated in May 1901. The portrait bust of the sculptor and goldsmith Cellini was thrown by Raffaello Romanelli who chose, in consonance with the taste of the time, to represent him in a romantic pose, the face furrowed by wrinkles, flowing beard, looking proud and with wavy hair. 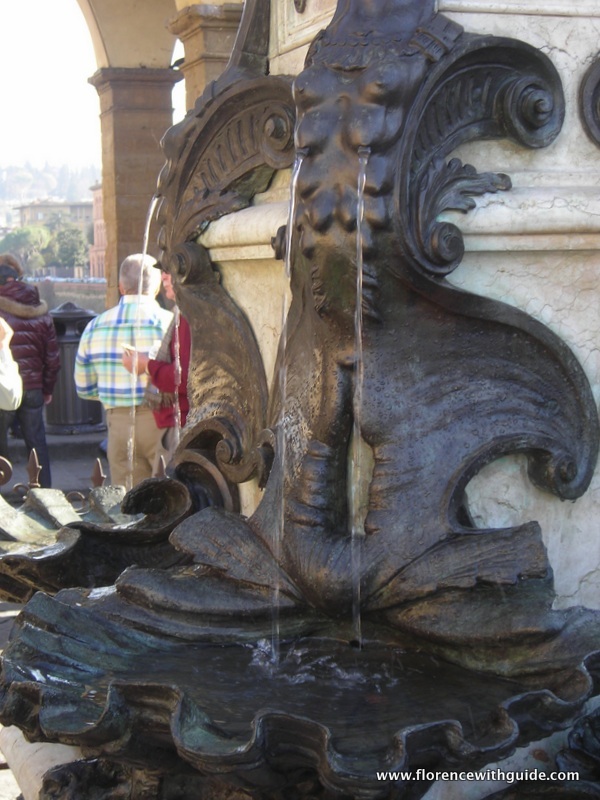 Romanelli also conceived the pedestal and the fountain using motifs taken from the pedestal of Perseus, Cellini’s masterpiece, adding the original shell shape where the water collects. The gate, now often burdened by love padlocks, was designed by Mariano Coppedè , creator of works of artistic craftsmanship and head of a successful workshop. Although Cellini could not have had any connection with the jewelry shops of the Old Bridge (since as of the year of the artist’s death, in 1571, on the bridge were still located the old butchers ‘ shops) in 1901 the goldsmiths were quick to make him their patron and teacher. 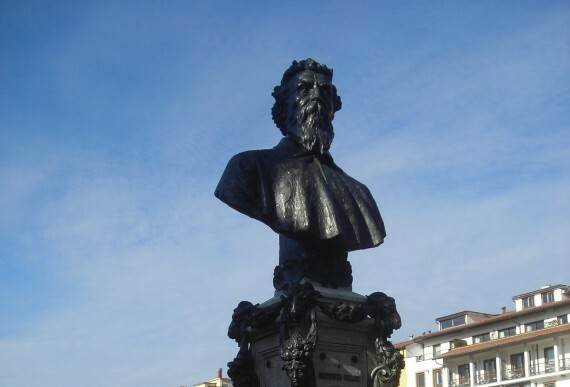 For those interested in the sculptures of Benvenuto Cellini (and his adventurous life!) we can offer a special itinerary dedicated to the Florentine sculptor , which includes a visit to Bargello Museum , where the original pedestal of Perseus is preserved, and other important works of the sculptor are housed, as well as an obligatory stop in Piazza Signoria , which still generously offers visitors the chance to enjoy the original Perseus, visible where it was placed in 1554 and offering on the back the –supposed- self portait of Cellini.